‘Tis the season for pears which is why I chose a Fresh Pear Tart from Sue of Couscous and Consciousnesses to make for this month’s #SRC (Secret Recipe Club). I encourage you to visit Sue’s blog and checkout all her amazing recipes, stories and photographs. What I find to be so much fun is that Sue lives in Nelson, New Zealand so when I visit Sue’s blog, it blows my mind to think of what a small world the blogging community really is, and how our shared love of food makes instant friends of people who have never once met. Yep. Food can do that! I chose Sue’s recipe for August’s #SRC weeks ago and had every intention of making it well in advance of when my group’s post were due. But, as we all know, sometimes life gets in the way of plans, and I didn’t actually get this tart made until yesterday and then I had to scramble to get it done. In my haste, I changed up Sue’s original recipe quite a bit because, 1 – I didn’t read through the recipe like I should have before I started and I forgot an important step (but I’ve added it into the instructions so you don’t make the same mistake I did), and 2 – I wanted to add some of my favorite flavors that I think pair wonderfully well with, well, pears! -Prepare the pears and set them aside in two bowls. 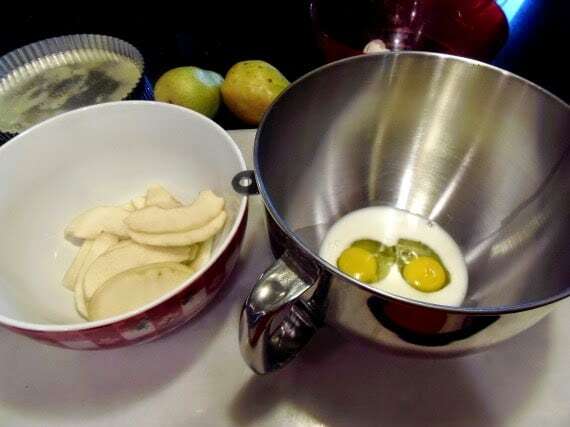 -In a large bowl with a hand mixer, or the bowl of a stand mixer using the paddle attachment, on low speed beat together the eggs and milk. -Blend in the milk, sugar and vanilla. 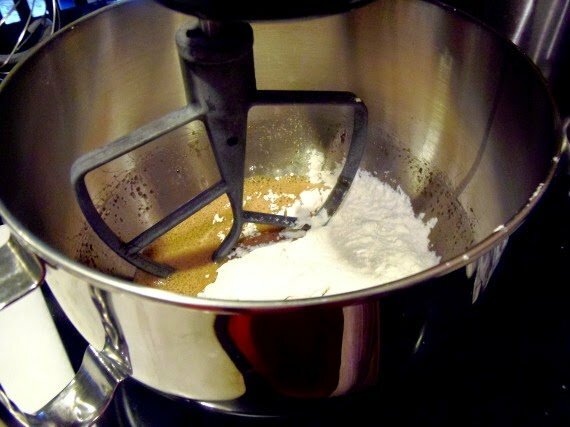 -Blend in the flour and salt until fully incorporated. 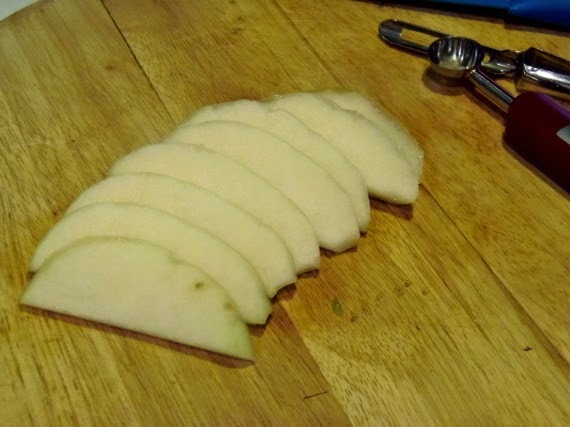 -Switch to a wooden spoon and stir in the grated pears. 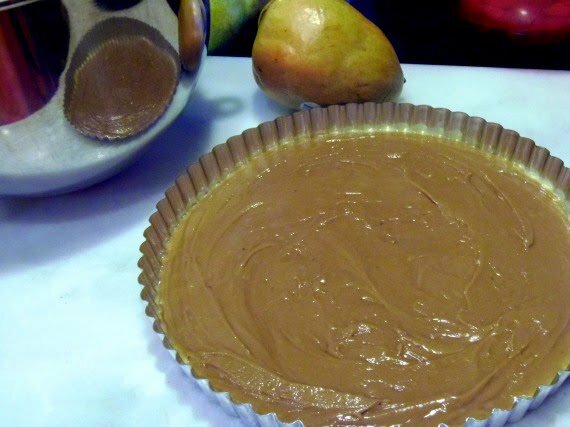 -Pour the batter evenly into a prepared tart pan that has been sprayed with baking spray. 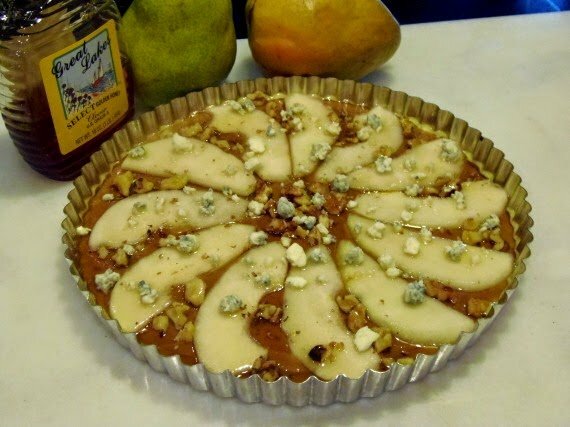 -Arrange the sliced pears over the top of the batter and drizzle the tart with honey. 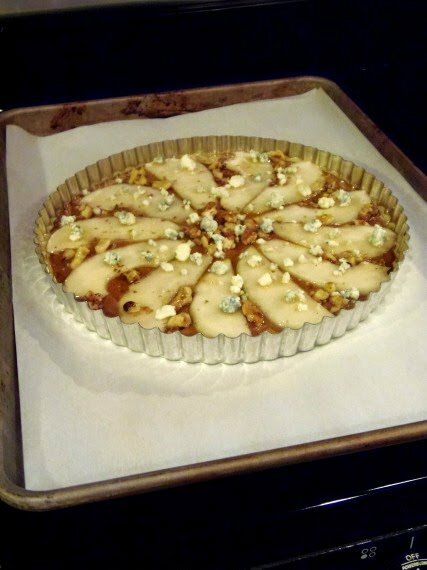 -Sprinkle the top of the tart with the chopped walnuts and the crumbled blue cheese. 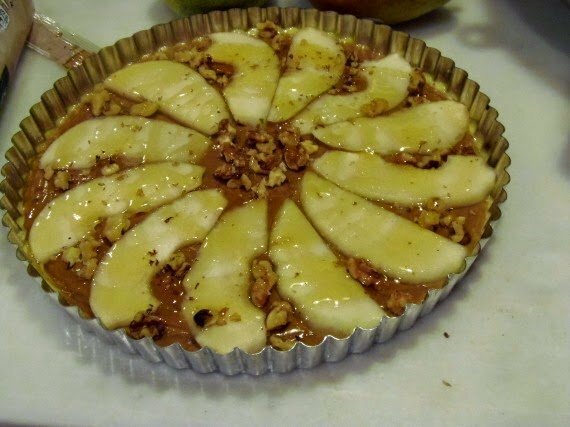 -Place the tart on a parchment lined baking sheet. -Bake in a preheated oven for 50 minutes (or until a toothpick inserted into the center comes out clean). -Cool the tart on a wire rack for about 15 minutes and then remove the sides of the tart pan by carefully pushing the bottom of the pan up and out. Here are a few step by step photos I took that will help you view the recipe in progress. Peel, core, grate and slice the 2 pears (grating photos not shown). Set aside. Blend together the eggs, milk, sugar, vanilla and salt. Add in the flour and salt. 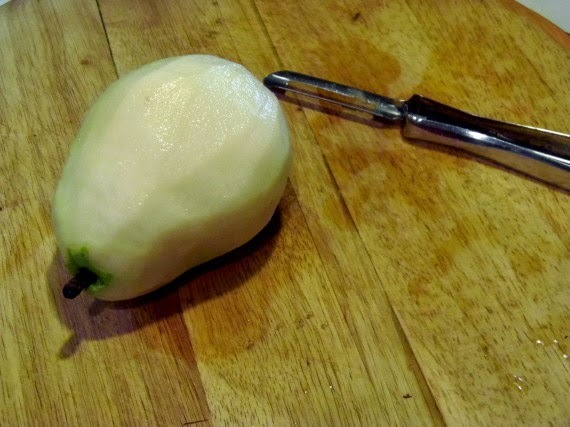 Stir in the grated pears (not shown). 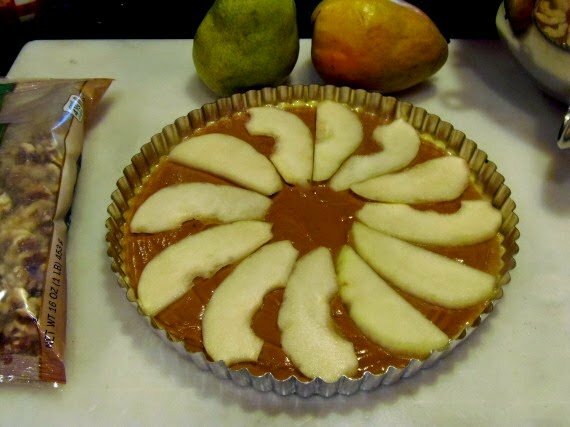 Pour the batter evenly into the prepared pan and top with the sliced pears. Drizzle with honey and top the tart with the walnuts and crumbled blue cheese. Place the tart on a parchment lined baking sheet and bake in a preheated oven. To see all the other group D Secret Recipe Club member’s submissions, just click on the photo thumbnails below and be ready to be really, really impressed! We have some really talented cooks, bakers and bloggers and I’m thrilled to be associated with them, and I’m happy to call many of them friends! Love the pear and blue cheese combo. I'm a huge fan of fruit and cheese pairings. I adore this combination, whether in a tart or in a salad. Definitely hanging on to this one! Oh – you've combined some of my favorite flavors in this recipe! Looks delicious! I am loving everything about this! I love fruit and cheese pairings, and this one sounds fantastic! Happy reveal day! This pear tart is DIVINE!!! That is just gorgeous. What a beautiful choice this month! Oh goodness. You have started a serious craving in me…holy yum! 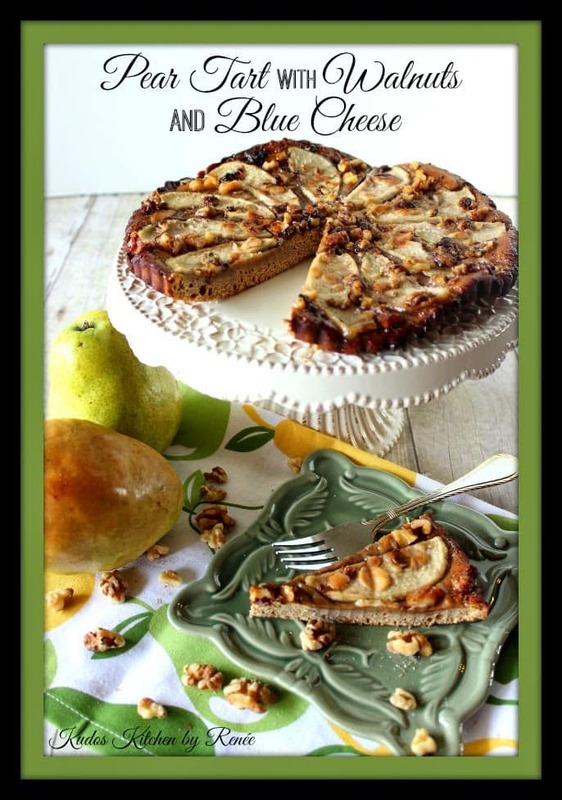 Love the combo of pear and blue cheese! 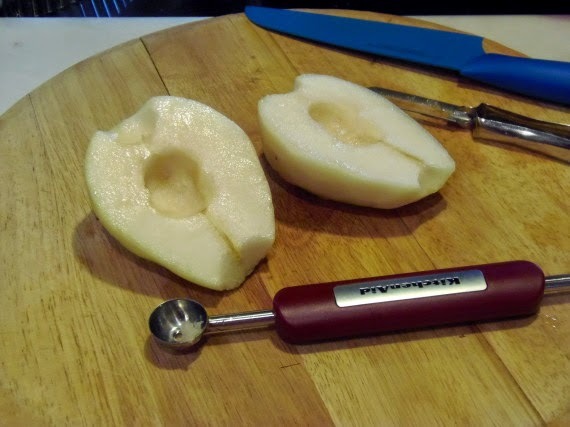 My husband loves pears so I'll have to make it for him. 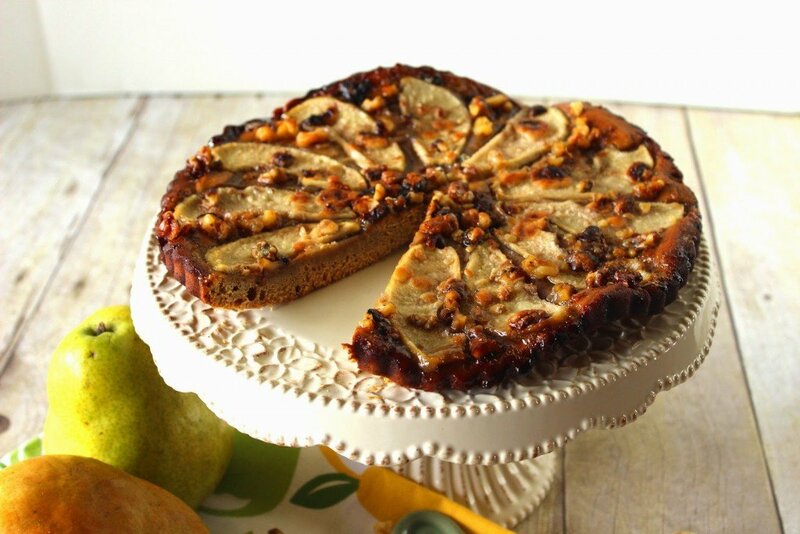 I love pears, and this tart looks too good! ooooh! I made a pizza this weekend with almost the exact same toppings! It was SUCH a great combination, so I know this tart was awesome. Great pick! Oh yes! Pear and blue cheese are meant to be together. What a lovely tart! This tart is simply gorgeous! I am so excited for pear season! I love pears and blue cheese together. You could probably make this savory also and serve it as a first course. Great choice this month. What a beautiful fall recipe! Love this. I just made a plum tart today! Will have to try pears next go round. love the blue cheese in this recipe!! I agree with these comments – what a gorgeous tart! Happy reveal day! Pear and blue cheese is a classic combo! Perfect recipe choice for SRC! It's beautiful too! This tart is a beauty!! I would hide in a corner and eat this all by myself! I love sweet dishes with blue cheese. Especially pears. Your tart looks GORGEOUS!!! Love the pairing of the pairs with the blue cheese! Hi Renee. Thanks you so much for your kindness. I loved cooking from your blog for my very first assignment, so it is doubly exciting that now you have had the opportunity to cook from mine. You are so right – food blogging definitely "shrinks" the world, and creates real friendships – it is mind-blowing. I love your version of this pear tart. 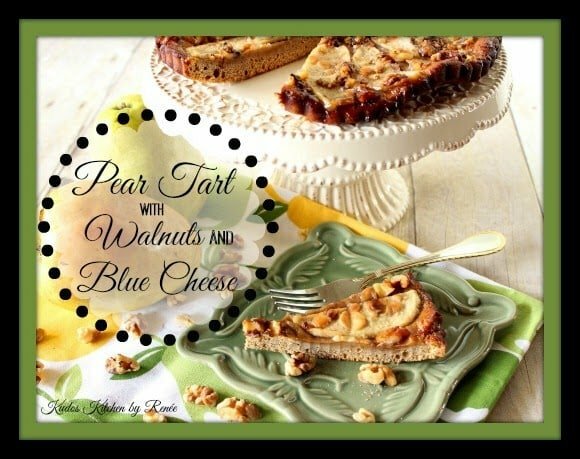 Pear with blue cheese and walnuts is one of my favourite combinations too, so I can't wait to give your lovely interpretation of the recipe a try. I have been eating pears nonstop lately since we have an orchard down the road. This tart look lovely. Gorgeous tart! Pears paired with fruit are always delicious. Super elegant and beautiful! Great SRC creation! Lovely! I can only imagine the wonderful flavors in this tart! Super SRC selection…visiting from Group B.